We are pleased to announce the George Washington University Milken Institute School of Public Health has been named as a recipient of the 2017 AIA COTE Top Ten Awards. Earlier this year, the project also received the AIA Institute Honor Awards for Interior Architecture. The project was completed in association with Ayers Saint Gross. Each year, the American Institute of Architects (AIA) and its Committee on the Environment (COTE) select the top ten examples of sustainable architecture and ecological design projects that protect and enhance the environment. In its 21st year, the program celebrates projects that are the result of a thoroughly integrated approach to architecture, natural systems and technology. 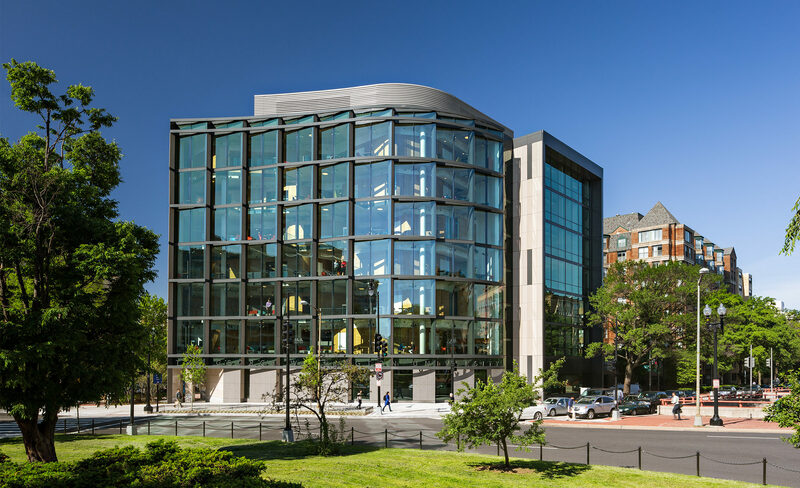 Located on iconic Washington Circle Park in the heart of the nation’s capital, GW’s School of Public Health is a rigorous, innovative response to site and program. With its most sustainable solutions so deeply embedded as to be nearly indistinguishable, it keenly demonstrates the symbiotic relationship between sustainability and public health. The 161,000 GSF building houses all seven of the School of Public Health departments in order to encourage more interdisciplinary collaboration among faculty and students. The project utilizes a combination of sustainable strategies and high efficiency equipment to achieve a 46.6% improvement for total energy cost savings over the ASHRAE baseline, an Energy Use Index (EUI) of 84 kBtu/SF, 18 of the 19 available LEED points for Optimizing Energy Performance and LEED Platinum Certification. Key equipment includes a heat pump chiller serving the base cooling load with heat rejection to the building hot water systems, as well as high efficiency chillers, pumps, cooling tower fans and boilers. A dedicated outside air system (DOAS), with dual wheel exhaust air heat recovery devices, serves the majority of the building; it delivers outside air directly through the building only once and is right-sized to provide proper ventilation, which is optimized based upon occupancy with the use of CO2 sensors. Chilled beams provide efficient heating and cooling without increasing the air change rate. The high performance building envelope reduces the load on mechanical systems with sunscreens, high performance glass and tight system details that minimize air leakage. An intelligent lighting control system minimizes the use of artificial illumination with schedules, timers, occupancy sensors, and daylight sensors, yielding a Lighting Power Density (LPD) of 0.84 W/SF, coupled with lighting controls results in a 70% reduction in lighting energy per ASHRAE 90.1. Our submission can be found on the AIA COTE website along with the other Top Ten recipients. To celebrate Earth Day and this great honor, we’ll be sharing interesting tidbits about the energy efficiency of the building on Twitter all day. What makes a building LEED Platinum?